Linda combines a lifelong study of classical music, including theory and composition, with a successful career in strategic marketing. She has studied classical piano since the age of seven, and as a high school student, she was chosen for a scholarship to the Pennsylvania Governor’s School for the Arts. 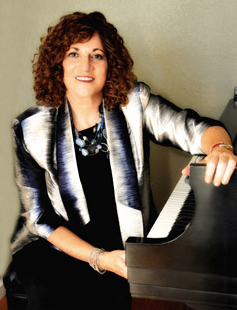 Linda continues to play regularly in solo and duet recitals, and attends the Sonata Piano Camp for adults on a regular basis. She has studied piano with Sheila Nachlis, Ann Vanko Liva, Debbie Sobol, George Lopez, Rami bar Niv, Polly Van Der Linde, and Thomas LaRatta. In her day job, Linda is a marketing expert who is the founder and president of Leverage2Market Associates, Inc., a strategic marketing company that helps organizations transform their business. She is a consultant, educator, author, coach and mentor, as well as the first marketing expert certified by Million Dollar Consultant Alan Weiss to deliver the Private Roster™ Mentoring Program for consultants and entrepreneurs. In 2009, her achievements were recognized by induction into the Million Dollar Consultant® Hall of Fame, as well as being named one of Silicon Valley’s Top Women of Influence. Her clients range from consultants and entrepreneurs to nonprofits, professional service firms, and Fortune 500 companies.